Military Cemetery/Memorial / Fynwent milwrol: Dainville Communal Cemetery. Pas de Calais. Killed in Action on Thursday 11 April 1918. 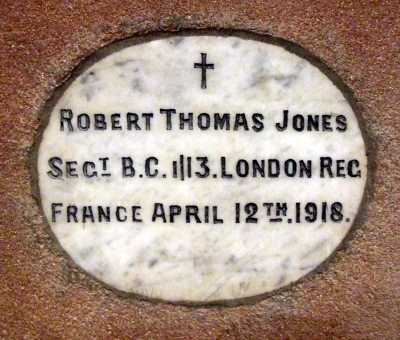 Nothing is known at present about the early life of Robert Thomas Jones, but on 4 August 1917 aged 28 years, he married Elizabeth Ann Davies aged 31 years at Holywell Parish Church. They lived at 7 Bronallt, Holywell, Flintshire. Robert’s father was William Edward Jones who was employed as a Painter. On 31 August 1918 a payment of £18.11s.11d was made by the War Office to Elizabeth Jones, this being monies owed to her husband Robert. On 27 November 1919, a furth payment which is recorded as a War Gratuity of £18.0s.0d was also made to her. There is no Flintshire Roll of Honour card for Robert Thomas Jones at the County Archives Office, Hawarden. Details of his medals were obtained from (www.forces-war-records.co.uk).